This prophetic word is a little different. During our 7 days of fasting and prayer we offered dream interpretations to everyone who participated in the fast. Well, one dream that came to us was clearly a prophetic dream that was not only for the dreamer but for the body of Christ in general. The dreamer gave us permission to share the dream as I felt very strongly this was not just for her but for all of us and I believe it will minister to you as well. As you read this dream, there are 3 different people and you should be able to identify yourself in one of the three. Here is the dream submitted by Kayura. I was at this big restaurant that looked like a banquet party or grand opening. It was huge with different levels and floors almost in resemblance of a tall parking garage staircase in a circular shape. However, it wasn’t a garage it was a building with open sections like how an outside parking garage would be, so you knew there were floors under you. The place was very elegant and fancy and everyone was dressed up. Myself and some other people that I know were on the very top floor and this was considered the VIP floor (or some special terminology that I can’t remember right now) however we’re all waiting to be served food or our dinner but had already been waiting a long time with no assurance from anyone about the delay, many were talking about it but just carried on socializing. So we have 3 persons in the dream. The main person, the aunt and the cousin. This dream is a picture of the body of Christ. When you are eating in your dreams you are in agreement, communion, covenant with the person you are eating with. This will help you to know which eating dreams you need to rebuke and which ones are good. We’ve already determined that this whole restaurant setup is the body of Christ. The security guard at the elevator is an angel. The female that looks like a manager is also an angel. Yes, there are female angels (Zechariah 5:9). The 3 persons represent each of us right now. The first person which is the main character is at the top level waiting on the promises of God. The second person which is the aunt is quite happy at the level where she is. The third person is the cousin and she’s frustrated with where she is. So what do you do? You start going backwards. Wondering what is going on in the old life. The old places that you left behind you want to go back to see what’s going on there. You left that place but now “you’re curious” about what’s happening there so you go take a look. In this dream she “sneaks” past the angel. I don’t think she actually did, she only thinks she did. You must remember that your angels are not going to stop you from backsliding. You want to go back to Egypt? They will let you go. She went down. The angel is at the elevator to make sure that no one from downstairs comes upstairs. He’s not going to stop the people from upstairs going downstairs. It is your choice – free will. You can read the prophetic word for 2019 on The Vault. Now she gets to this area and everyone already had their food, ate and some are even leaving. Remember the bigger the promise the longer the wait. So here is another person in the body of Christ (family) that ate the food, loved the food and thought it was good. This is the person that is satisfied with where they are. They are totally oblivious that there is a VIP section. They don’t care, they are happy with the half cooked food. This would be akin to the Israelites in the wilderness being given manna. Was it from God? Yes. It was food when they needed food but this was not the abundance of God this was just to get them through a rough season. This was transitional food. Instead of asking God to get them out of the wilderness when they got tired of manna they asked for quail (Numbers 11). The wilderness shouldn’t be a place of comfort and prosperity. The manna is wilderness food and therefore we should look to get out of it and not accept it as the Lord’s best for us. In the US we have a welfare system, which is a blessing from God and can help many people in their wilderness season (time of need). But, this is not the abundance of God. It is a transitional supply. Not a place for us to camp out or ask God to bless us by giving us more aid while still on welfare (that would be like asking for quail). Don’t ask God to give you more free stuff from the government. Ask Him to get you out of that and into a place of abundance where you can be blessed to be a blessing and give to others from your overflow. 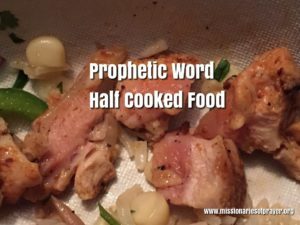 We need to recognize when we are identifying half cooked food as the full blessing of God and rebuke the complacency. Never try to make a transitional place a permanent place. This is not God’s best for you. Be warned that as He starts moving you out from the wilderness the manna will cease. So, don’t freak out, it’s going to be uncomfortable…but this means you are heading in the right direction. This is the daughter of the aunt. Just like the children born into the wilderness to the Israelites, she knows there has to be more. She ate the half cooked food (manna) because that’s what she was served but she knew it was not the best. These are the people that know that what they have now is not good. They need something more. They know that more exists and they are frustrated because they really just need someone to tell them where the VIP level is and how to get there. It is one prayer away and we’ll address that at the end. Now, after some of us go back to the old thing we generally realize why we left that place to begin with. There’s nothing there that we want anyway. You have outgrown that place. It has nothing to offer you. You will gladly wait on your food because you know when it arrives it is going to be good. So to the main person’s surprise, the angel admits to serving the family half cooked food. Why would that happen? Well, the angel said it “you need to be patient”. When we are impatient we accept the Saul instead of waiting for David. We accept the Ishmael instead of waiting for Isaac. We become shortsighted and sell our birthright for a pot of stew like Esau. We take whatever we can get that suits our timeline and then praise God for the blessing even though upon closer inspection you’ll find it really wasn’t a great blessing. Down the line, it is going to cause some problems. Stomach ache. If we keep pestering God, He’ll give it to us! So, yes the angel will deliver your half cooked food to you if you can’t wait. Read Romans 1:18-32. It tells us that even as Christians when we don’t follow what God has told us to do through His word and we continue to live lives that are unpleasing to Him, He eventually gives us over to a debase mind. That means after awhile we begin to honestly believe our evil desires and thinking are actually good. And, when we see the same evil desires in others we approve of it as well because it matches your rhetoric. It makes us feel comfortable and “right” about the way we think. I want you to stop for a minute read the list of debased mindset again and ask the Lord to reveal to you if there is any of this in your life. These are the areas where you have quenched the Holy Spirit and you need to get renewed. Your conscience has been seared in these areas and you need the Lord to renew your mind and spirit. The good news is the main person had waited 2 hours, the angel said the food needed to be marinated for 2 hours before it was cooked. This means, it’s almost time to eat! Praise God!!!! Just hang on a little longer. I want to give you this prayer based on the dream. Abba Father, thank you that every good and perfect gift comes from you the Father of light in whom there is no variation of shadow of turning. You are not a Father when your children ask you for bread you give them a snake. You give good gifts to your children! They’ve passed your approval. We pray now that you give us patience to wait for your best. We submit our timeline to You and ask that You produce this blessing when you know we are able to handle it and while we are waiting prepare us to receive it. Give us grace that we won’t grumble and complain. We pray that if we have grown accustomed to the transitional supply that you would wake us from our slumber, strengthen us to continue the journey and look for the best from you. Lead us to a higher place in you God. Give us the blueprint to finding you in the secret place so that we will have a picture of the goodness you have planned for us. Give us a vision of this promise land. Restore our hope and bind the hopelessness. We pray for any areas where we may have quenched your Holy Spirit and seared our conscience that we will have a renewal. Hit a reset button on our spirit. May we hate the things that you hate. May we call sin, sin. Call the defiled, defiled. Cause us to embrace purity and holiness. Give us the mind of Christ, in Jesus name, Amen. I hope this blessed you as much as it blessed me. You can comment below. Thank you so very much for this timely gift! It is impossible to express just how perfect the timing was! Much love and gratitude. Thank you Lord and please continue to bless MOPS! This is such a timely word for me and believe for all of us. Now I understand i need be patient for God’s timing. Thankyou . Was a great eye opener. Thanks a lot and may the Holy Spirit continue to guild you all the way, Amen. This word speaks to me . Glory to God! Thank you for sharing, some months ago GOD gave me a dream with this VIP letters written on a very modern object, I recognized it…let’s keep waiting, He is Faithful, and Amazing. Blessings to all. God bless you and your ministry! So thankful! Hello thank you for posting this. I have a question about how to recognize when eating in your dream is bad. I’ve read a lot of Ministers blogs who talk about dreams and they say that eating in your dream is like spiritual poison. And food in your dream is a bad sign as well. How do you know the difference. Last year I had a dream of sitting at a table with someone they began telling me things about them and when I asked them how they knew and they said they were psychic. I started to rebuke them! They then turned into a demon and I woke up. You said: This dream is a picture of the body of Christ. When you are eating in your dreams you are in agreement, communion, covenant with the person you are eating with. Although I wasn’t eating i was just sitting with that other women who turned into a demon I rebuked her in the dream. And canceled the demons assignments when I woke up. I’m just asking because when I see food in my dream I pray against the devices of the enemy. We already answered the question Shay….When you are eating in your dreams you are in agreement, communion, covenant with the person you are eating with. That was so good and timely. Yes, it blesses us as it has blessed you, thank you! As you wrote, “As you know, when we have very big promises it generally means that you will have to wait ‘for a minute’ for this to manifest.” I want to share with you all something a friend sent me. “IF YOU SAW THE SIZE OF THE BLESSING COMING, YOU WOULD UNDERSTAND THE MAGNITUDE OF THE BATTLE YOU ARE FIGHTING.” I made this into little signs and hung them all over my house and work. To God be the Glory! Definitely a needed and on time Word; uplifting and encouraging. Thanks to the person who shared the dream and MOP. God’s blessings to all. Hang in there fellow VIP’s …the promises are on the way!